For our trip to Chicago, we decided to pack light so as not to pay the equivalent of an extra plane ticket to check bags. Plus, there are few things more thrilling than traipsing several miles through some of the country's busiest airports while carrying heavily stuffed luggage and an infant (who, I might add, has twice blown out his diaper just as we're entering security). 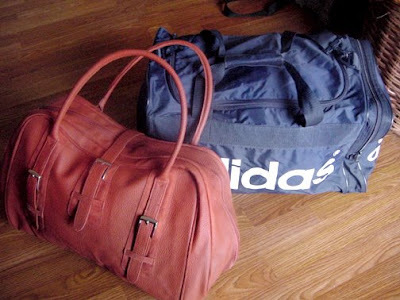 As you can see, it was a tremendous feat of restraint and cunning getting everything into the Adidas duffel and the Estee Lauder tote. And if you assumed that the Estee Lauder tote was my bag, you would be wrong. I'm not sure what his logic was, but for some reason Noah decided to be very modern and pack his things in the girly satchel. But look how cute it is! Who could blame him? In other news, we made an exciting discovery when we heard Cody furiously barking uncommonly close to the house. (If you'll remember, he normally goes to the far corners of our backyard to scream at the neighbors instead.) I was afraid of what I might find, and rightfully so. That's right. Another reptile has wandered into our yard. At first I was terrified that if I got close, the creature would snap of a toe or fingertip, in yet another stunning example of my prowess regarding critters. 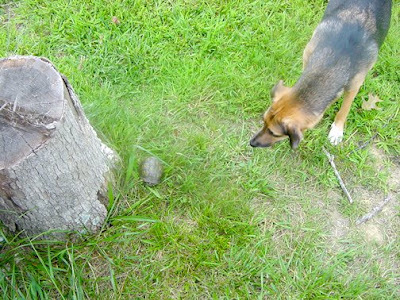 Then Noah informed me that it was just a box turtle. I know; I shouldn't be so reckless. I promptly washed my hands after this for fear of contracting some weird turtle disease. Don't laugh; I've been known to come down with things that many well-practiced family doctors have never heard of. In my life I have had a scratched cornea, a ranula (do not look this up, you will be disgusted), and intrahepatic cholestasis of pregnancy. At least I've been blessed with stunning good looks and a sense of adventure. Oh my GOD! 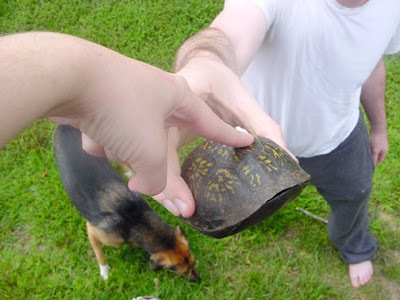 You are the luckiest person to have found a box turtle right in your very own backyard!!! 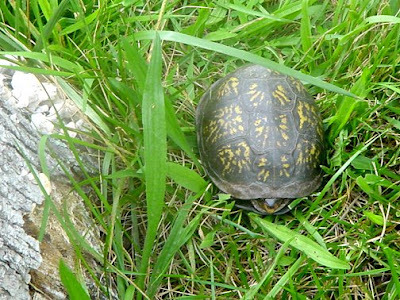 As you may recall, Will and I were in search of a turtle to befriend as a pet when our hearts were broken to find out that it is ILLEGAL to sell turtle as pets in the backward state of North Carolina. However the pet store owner was quick to inform us that we could cross the border (to South Carolina that is) and bring one back. That's at least a 3 HOUR drive for a stinkin' turtle while you seem to be harvesting your own turtle farm in your back yard! I say, share the wealth!